Septic tanks are one of those things that we want to be out of sight and out of mind, but the state of Maryland has recently passed legislation that has brought septic tanks to the forefront. The impetus for the new law is to improve the water quality of the Chesapeake Bay, a most worthy cause that we all want to support. That’s the good news. The bad news is that these high tech septic tanks add about $10,000 to the cost of a typical septic system, not including typical yearly maintenance costs. And while we can all agree that water quality is important, the percentage of pollution caused by septic tanks is much lower than other sources, which the state has not addressed. These mandated septic tanks, for areas not served by public utilities, are required not only for new homes, but also for bathroom and bedroom additions and replacement of failing septic systems. The contaminant that the state legislation is trying to reduce is nitrogen. 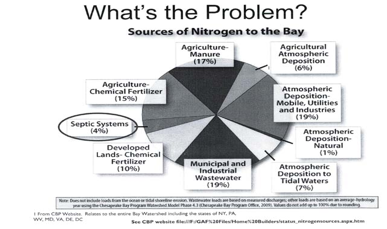 Septic systems contribute about 4% of the nitrogen flowing into the bay. In order of nitrogen contribution from greatest to least is: Agricultural, including manure and fertilizer 38%, municipal and industrial wastewater 21%, utilities and industries atmospheric deposition 19%, residential fertilizer 10%, natural atmospheric deposition 8%, and septic systems 4%. Since this whole discussion revolves around nitrogen, let’s take a quick layman’s look at this element, its importance and impact on our lives, and the effects of an overabundance in our ecosystem. 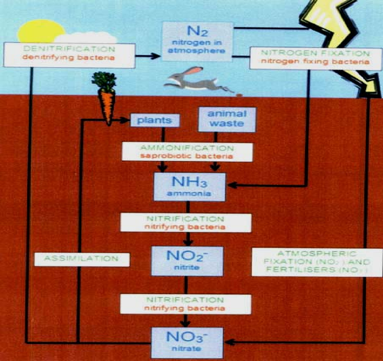 Nitrogen is an essential requirement for life on earth. Nitrogen, in the form of organic compounds, is a component in all amino acids that make up the RNA and DNA genetic material for animals and plants. Nitrogen is also present in chlorophyll molecules which are essential for plant photosynthesis. Although nitrogen gas makes up about 78% of the earth’s atmosphere, nitrogen gas, an inert form of nitrogen, cannot be directly assimilated into plants and animals. It must first be processed chemically, by fertilizer producers, or naturally by nitrogen fixing bacteria that live in the soil and the oceans, and in the root structure of some plants (peas, beans and alfalfa). These nitrogen fixing bacteria use an enzyme to bond the nitrogen molecule to hydrogen and oxygen molecules resulting in ammonia, nitrites and nitrates, collectively called reactive nitrogen, which can be processed by plants and ingested by animals that eat plants. Another form of bacteria in the soil and the oceans completes the cycle through the de-nitrification process that converts the reactive nitrogen back to inert nitrogen gas that is released into the atmosphere. Unfortunately, the eloquent balance in nature has been disturbed by the actions of humans. There may not be an overabundance of reactive nitrogen on land, but through runoff of agricultural and residential fertilizers, pollution from sewage treatment plants and septic tanks, and from air pollution from fossil fuel combustion, we have placed an overabundance of reactive nitrogen into our streams, rivers, bays, and ultimately the oceans. This overabundance of reactive nitrogen, a plant nutrient, results in over growth of certain aquatic plants, like algae, that block sunlight and soak up excessive amounts of oxygen resulting in a shortage of oxygen for fish, shell fish and some native bay grasses that are necessary for a healthy estuary. The end results are dead zones in the bay, and even in parts of the ocean along the coast where there are major fish kills and disappearing native bay grasses. Excess nitrogen, in the form of nitrates, can also pollute our well water. Most of these nitrates come from farming fertilizer and livestock manure. The maximum safe amount of nitrates in drinking water is 10 parts per million; concentrations greater than this can cause harm, especially to infants and young children. If you live in a rural area with crop farming and livestock, I would recommend that you have your well water tested once a year if you have young children or grandchildren. Reverse osmosis filtration systems are available that will remove the nitrates from drinking water. Now let’s get back to these new septic tanks, and how they differ from the old style. The traditional septic tank is made of concrete with two chambers. The first chamber is on the inlet side of the tank where waste water enters from the house. The solids in the waste water settle to the bottom of this chamber while the wastewater overflows into the second chamber. Inside the septic tank, anaerobic bacteria (the bacteria that do not require oxygen) breakdown the organic compounds in the waste water to ammonia, nitrates and nitrites. The waste water then flows from the septic tank into the gravel drain field where bacteria in the gravel further break down the pollutants. The new septic tanks have three chambers. The first chamber functions much the same way as the first chamber in the traditional septic tank where the solids settle and anaerobic bacteria breakdown the organic compounds to ammonia, nitrates and nitrites (reactive nitrogen). The middle chamber contains a motor attached to an agitator, something like your egg beater, that mixes the waste water with air that encourages aerobic bacteria (bacteria that require oxygen) to breakdown the reactive nitrogen in the waste water to inert nitrogen gas which is released to the outside air, through a vent in the middle chamber, thus removing about 50% of the reactive nitrogen that is the cause of water pollution. Next, the wastewater enters the third and last chamber where it passes through a filter which removes most of the remaining suspended particles in the waste water, resulting in fairly clear waste water discharged into the gravel drain field connected to the septic tank outlet pipe. In my next newsletter, we will look at the overall cost for the new septic tanks, including maintenance costs. I will also discuss how reactive nitrogen water pollution can be reduced, including what we can do as individuals, to help.